A golden lion difference with a white label of three points, crowned with the Coronet of the Heir apparent and standing on the same coronet; gold and ermine mantling. The Royal Arms difference with a white label of three points; with an inescutcheon of four lions passant guardant, in gold and red, counterchanged (for the Principality of Wales). A golden lion, wearing the coronet of the Heir apparent, and a silver unicorn, both difference with a white label of three points. Badges: Prince of Wales's feathers, Welsh dragon with a white label of three points and crowned escutcheon of the Duchy of Cornwall. The coat of arms, in its current form, was devised for Charles, Prince of Wales in 1958. It contains the badges and elements taken from all four of the constituent countries of the United Kingdom as well as from the many titles the prince holds as heir apparent. 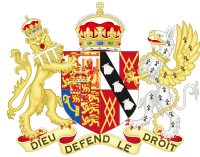 The history of the coat of arms is closely linked with that of the Royal coat of arms of England and the Royal coat of arms of the United Kingdom. However, as the noted antiquarian and heraldist Charles Boutell wrote in 1863, "The Arms of the Prince of Wales have a distinct individuality of their own, with which nothing ought to be directly associated." The coronets of the Prince and the Peers of the realm were regulated by King Charles II by Royal Warrant, signed on 9 February 1661. Part of the warrant proclaimed: "Our Will and Pleasure therefore is, That the Son and Heir Apparent of the Crown for the time being, shall use and bear his Coronet composed of Crosses and Flower-de-Lized with one Arch; and in the midst a Ball and Cross, as hath our Royal Diadem". In other words, the heraldic coronet used in the Prince of Wales's coat of arms is similar to the heraldic crown (St. Edward's crown) used in the Royal arms, except that instead of two intersecting arches it has only one. Boutell wrote that: "It should be noticed, however, that this coronet belongs to the prince as eldest son of the Sovereign and heir-apparent to the Throne, and not as Prince of Wales". The coronet is also used by the Prince of Wales's consort, in her coat of arms. 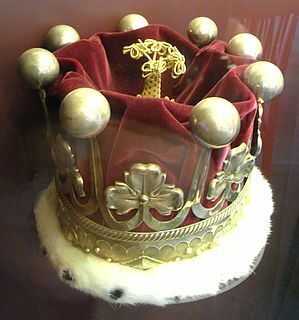 The heir's coronet was confirmed in another Royal Warrant signed on 19 November 1917 by King George V. The warrant proclaimed: "by the son and heir apparent of the sovereign and his successors a coronet composed of crosses and fleurs-de-lis with one arch and in the midst a ball and cross as in the royal crown." Currently there are three physical examples of coronets used at one time or other as part of the Honours of the Principality of Wales; the Coronet of Frederick, the Coronet of George and the Coronet of Charles. However these physical manifestations have not affected the graphical representation of the coronet in heraldic art. Beginning with the reign of King Edward I, a label of three points Azure (or blue) was used by his son, the future King Edward II, to differentiate his arms from those of his father. Without such a label their arms would be identical. Within heraldry this system of differentiating arms is called cadency. The label is placed on the chief (or top) of the shield of arms, with the ends extending across from the dexter to the sinister sides of the shield. It was Prince Edward the Black Prince, heir of King Edward III, who first used a label of three points Argent, also white or silver. This has been the label of the heir apparent ever since, without regard to the system of cadency used by other members of the royal family. Coat of arms of Edward, Prince of Wales as illustrated in Burke's Peerage 1914 edition. The Prince of Wales's crest follows closely that of the Sovereign, but always with the appropriate label of difference displayed. This crest depicts a "Lion Or, passant guardant, wearing a coronet of the Heir, and differenced on the shoulders with a label of three points Argent." The lion always stands on a larger coronet of the Heir, which then sits on a golden helmet or the Royal Helm. From the sides flow the gold and ermine mantling of the royal family. Similarly to the crest, the prince's supporters follow those of the Sovereign. On either side of the shield of arms and standing on gold scrollwork are the royal supporters: the Lion and the Unicorn. Both beasts have the prince's label charged around their necks, again as an appropriate mark of difference. The lion on the dexter side, an ancient symbol of England, is crowned with the coronet of the Heir. The beast has been a supporter of the English royal arms since the reign of King Henry VIII. The white unicorn of Scotland on the sinister side, was incorporated into the royal arms from the Scottish royal arms after the Union of the crowns in 1603. Prince Charles was appointed a Knight of the Garter in 1958. Since the founding of the Order in 1348, almost every Prince of Wales has been appointed to the Order. The Order of the Garter is represented in the coat of arms by its namesake the blue buckled garter, which bears in gold letters the motto, Honi soit qui mal y pense, French for "Shame upon him who thinks evil of it". Under the coat of arms is a scroll bearing the motto Ich dien, German for "I serve". The motto of uncertain origin first appeared on the arms of Edward of Woodstock, or the Black Prince. Prince Edward was created Prince of Wales by his father King Edward III on 12 May 1343. Legend holds that the Black Prince took the motto as well as the ostrich feathers from King John the Blind of Bohemia, who was killed fighting alongside the prince and his father at the Battle of Crécy in 1346. The motto is also a near homophone for Eich Dyn, "Your Man" in Welsh. The Prince of Wales as part of his full achievement of arms has many Heraldic badges, which represents the history and sovereignty of his many titles. 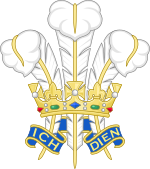 The Prince of Wales's feathers badge comprises "A plume of three ostrich feathers Argent enfiled by a royal coronet of alternate crosses and fleur-de-lys Or" with the motto 'Ich Dien' on a dark blue ribbon. The badge is probably the most recognisable element of the Prince of Wales's coat of arms. It has become synonymous as a personal insignia of the prince and also of the Principality of Wales itself. 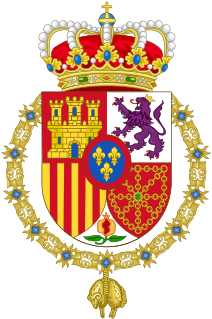 In a personal capacity the badge is granted as a Royal Warrant of Appointment to companies that regularly supply of goods and services to the Prince. Currently there are 170 companies which are entitled to display this badge with the words 'By Appointment to HRH The Prince of Wales' underneath. The badge can be depicted on all premises, delivery vehicles, stationery and advertisements as well as on the individual products themselves. Other organisations associated with Wales or the prince incorporate the badge into their own insignia including many Welsh regiments of the British Army (such as the Royal Regiment of Wales) and the Welsh Rugby Union. Feathers used as either a crest or a badge have been an ancient heraldic badge of the House of Plantagenet. However it was not until its incorporation into the heraldic achievements of the Black Prince that the feathers have become an omnipresent feature of the coats of arms of the Prince of Wales. On 10 December 1901 a warrant signed by King Edward VII approved the addition of a badge of the Red Dragon to the coat of arms of the Prince of Wales. The proclamation stated that: "on the sinister side a representation of the Badge of Wales, namely, on a mount vert a Dragon, passant gules, differenced (as in the Crest) with a label of three points argent." This was to complement the feathers badge, which was to be depicted on the dexter side of the prince's crest. The Red Dragon, or Y Ddraig Goch, has been a symbol associated with Wales since the time of Cadwaladr, King of Gwynedd in the 7th century. It was not until the beginning of the House of Tudor that the Red Dragon became a royal badge of the kings of England. Henry Tudor (later King Henry VII) displayed the Dragon of Cadwaladr on his battle standard. The red dragon became an official royal badge of the sovereign (representing Wales) according to a warrant issued in 1801. The warrant at the same time also confirmed the Tudor rose as a royal badge for England, the thistle for Scotland and the golden harp for Ireland. The arms of the Duke of Cornwall are: "Sable, fifteen bezants, five, four, three, two and one." These arms were derived from those of Richard, 1st Earl of Cornwall, King of the Romans, son and heir of King John, who was also Count of Poitiers (or Poitou), represented by arms made up of peas (poix) or gold coins. Upon the accession of the prince's mother as Queen Elizabeth II on 6 February 1952, Prince Charles was automatically made the Duke of Cornwall. As such he is able to display the arms of the duchy on his coat of arms. This title has been granted to every heir apparent since 17 March 1337, in accordance with a charter issued by King Edward III for Prince Edward the Black Prince, his eldest son and heir. The arms of Gwynedd or Llywelyn ap Gruffydd were the arms of the princes of North Wales; the arms are blazoned as: "Quarterly Or and Gules, four lions passant guardant counterchanged." The arms of Dafydd ap Gruffydd were the arms of the last autonomous prince of Wales, before his execution at the hands of King Edward I of England in 1283. 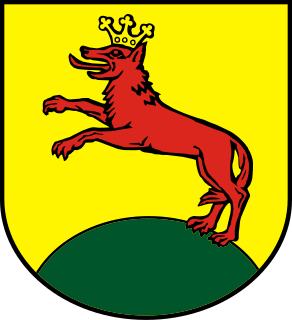 His arms are the same as those of Llywelyn, but with Azure replacing Gules. The arms of Owain Glyndŵr were supposedly based on those of the houses of Dinefwr and Mathrafal. Blazoned as: "Quarterly or and gules, four lions rampant armed and langued azure counterchanged." 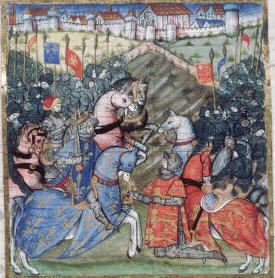 Glyndŵr unsuccessfully led the Glyndŵr Rising for Welsh independence that was crushed in 1415 during the reign of King Henry V.
Les armes le bon roi son pere. Translated as: "Arms he bore of the good King his father, with a label azure. May God grant him grace and courage to his royal father’s measure!" The quote is from a contemporary poem of the siege of Caerlaverock in 1300. The poem refers to Prince Edward (the future of Edward II), who was born in 1284 at Caernarfon Castle and was then presented to the Welsh chiefs by his father King Edward I as their Prince. However it was not until seventeen years later that he was presented with the title of Prince of Wales. His arms depicted the arms of the Kingdom of England with a label of three points Azure. Edward, the Black Prince's arms were: "Quarterly France ancien (reflecting King Edward III's claim to the French throne) and England with a label of three points Argent". This shield is often called his 'Shield for War'; additionally a scroll with the French word Houmont (or Magnanimous) appears above the shield. On his tomb however an additional shield of arms was also displayed, the 'Shield for Peace': "Sable, three ostrich feathers, their quils passing through escrolls Argent bearing the words 'Ich Dien'"; the same motto also appears above the shield in another scroll. 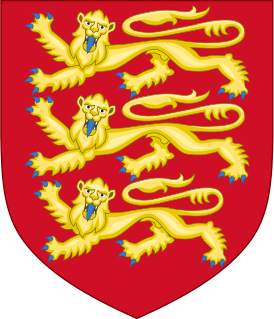 The future Richard II was granted the shield for war as his arms when he was created Prince of Wales, a few months after the death of his father in 1376. Mirroring the changes in the Royal arms, as brought about by King Henry IV, who changed the 1st and 4th quarter from France ancien to France moderne. This version was first granted to the future Henry V. The arms were then used by various Princes of Wales from both the Houses of Lancaster (Edward of Westminster) and York (the future Edward V and Edward of Middleham). The arms remained unchanged during the Tudor dynasty when the title was granted to Arthur Tudor in 1489. With his death in 1502, the arms were re-granted to his brother, the future Henry VIII, in 1504. The Stuart succession brought major changes to arms by incorporating elements of the arms of Scotland and Ireland in the 2nd and 3rd quarters respectively. The arms were first granted to Henry Stuart, the Duke of Rothesay after his father James VI ascended the throne of England as James I. The arms were then granted twice more to the future Charles I and Charles II. It has been reported that James, the Duke of York (future James II) also bore the arms (despite not holding the title Prince of Wales), but only when his position as heir-presumptive to his brother became secure after the Exclusion crisis. The arms were once more granted to James Francis Edward, who after 1688 became the Jacobite Pretender, whose son Charles Edward (Bonnie Prince Charlie) continued the use of the arms in exile. 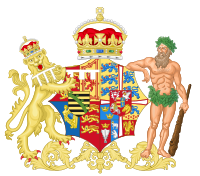 The House of Hanover inherited the throne of Great Britain after the death of Queen Anne in 1714, which led to the incorporation of the arms of King George I's possessions in Germany into the Royal arms. The blazon for the arms became: "1st quarter England impaling Scotland, 2nd France moderne, 3rd Ireland and 4th the Electorate of Hanover, with a label of three points Argent. The Hanoverian quarter depicted: Brunswick, Lüneburg, Westphalia and an inescutcheon plain Gules, over all three." In the Royal arms the inescutcheon contained a depiction of the Crown of Charlemagne, which was an augmentation of honour granted to the Prince-electors of Hanover as Arch-Treasurer to the Holy Roman Emperor. As heir to this Imperial office, only the Prince of Wales was entitled to bear the empty inescutcheon, in right of inheritance of this imperial office. With the Act of Union of 1800, the arms of the Prince of Wales changed with those of the Kingdom. The ancient claim to France was abandoned, and England occupied the 1st and 4th quarter, while the Hanoverian quarter became an inescutcheon at the centre of the shield. This shield of arms was granted only once to George Augustus Frederick (the future George IV), who also became Prince regent in 1811. The Royal arms were once again altered following the ascension of Queen Victoria to the throne in 1837, when the Hanoverian shield was dropped. The Hanoverian inescutcheon was replaced by the arms of Saxony, which was a heraldic inheritance from the queen's husband Prince Albert of Saxe-Coburg and Gotha (a Duke of Saxony). The inescutcheon only appeared in the arms of Albert's male-line descendants, and not in the Royal arms itself. 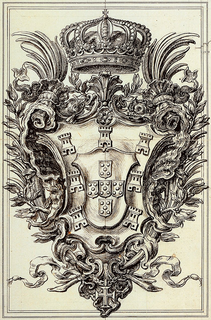 According to the antiquarian Charles Boutell, the inescutcheon was placed as an "escutcheon of pretence", that "does not appear to be in accordance with either the spirit or the practical usage of true historical Heraldry". These arms were granted twice, first to 'Bertie' (later King Edward VII) and to the future George V. In his 1909 book A Complete Guide to Heraldry, Arthur Charles Fox-Davies writes: "It is much to be regretted that the arms of H.R.H. the Prince of Wales (the future George V) do not include the arms of his sovereignty of the Duchy of Cornwall, nor any allusion to his dignities of Prince of Wales or Earl of Chester." In 1910 Prince Edward Albert was invested and presented to the Welsh people as Prince of Wales at Caernarfon Castle, the first time in six hundred years. Welsh local authorities had asked that the red dragon might be introduced into the Royal arms and the coinage, but neither of these wishes were granted. However a year later in 1911, King George V issued an order in council that replaced the inescutcheon of Saxony, in the Arms of the Prince of Wales, with an inescutcheon with the arms "representing the Principality of Wales". Blazoned as: "Quarterly Or and Gules four lions passant guardant counterchanged, ensigned by the Coronet of His degree." In 1958 Prince Charles, the Duke of Cornwall, son of Queen Elizabeth II was granted the same arms when he was made Prince of Wales. The family of the Prince of Wales is entitled to use certain heraldic features. The consort of the Prince of Wales (titled the Princess of Wales) is granted a unique coat of arms upon marriage, based on the impaling of the prince's arms (on the dexter side) and her father's arms (on the sinister side). The consort is also entitled to use the prince's supporters (with the appropriate label) and the use of the prince's coronet over the arms. The current consort; Camilla, the Duchess of Cornwall, was granted a coat of arms on 17 July 2005 upon her marriage to Charles, Prince of Wales. The children of the heir apparent were given their own distinct coronet, unlike any other grandchildren of the sovereign. This was confirmed in the 1917 Royal Warrant, which proclaimed: "to all the sons and daughters of the son and heir apparent of us and of our successors a coronet composed of two crosses pattée (or crosses formy) four fleurs-de-lis and two strawberry leaves." The wives of the sons of the Prince of Wales use the same coronet as their husbands. Such as arms borne by Catherine, Duchess of Cambridge, which was granted to her in 2011. Wikimedia Commons has media related to Coat of arms of the Prince of Wales. Wikimedia Commons has media related to Historic coat of arms of the Prince of Wales. ^ a b c d e f g h i j "Titles and Heraldry: Coat of Arms". Official website of the Prince of Wales. Retrieved 2018-08-10. ^ "Warrant of Feb 9, 1661". www.heraldica.org. Retrieved 2018-08-10. ^ a b "Warrant of Nov 19, 1917". www.heraldica.org. Retrieved 2018-08-10. ^ "Honours of the Principality of Wales". www.royal.uk. Retrieved 2018-10-15. ^ "Titles and Heraldry: Prince of Wales's Feathers". Official website of the Prince of Wales. Retrieved 2018-08-10. ^ "Titles and Heraldry: Royal Warrants". Official website of the Prince of Wales. Retrieved 2018-08-10. ^ Ashburner, Robin (2001). "Flags in Wales" (PDF). flaginstitute.org. Retrieved 2018-10-15. ^ Fox-Davis, Arthur Charles (1915). The Book Of Public Arms. A Complete Encyclopaedia Of All Royal, Territorial, Municipal, Corporate, Official, And Impersonal Arms. London: T. C. & E. C. Jack. p. 210. ASIN B00TT2UM5S. ^ Burke's Peerage (1973). Burke's guide to the Royal Family (Burke's genealogical series). London: Burke's Peerage; 1st edition. p. 137. ISBN 0220662223. ^ Burke's Peerage (1914). Burke's genealogical and heraldic history of peerage, baronetage and knightage. London: Burke's Peerage. p. 16. ^ "Dafydd ap Gruffydd's outlawed lions return on coat of arms". North Wales Daily Post. 2018-03-01. Retrieved 2018-10-16. ^ "The Siege of Caerlaverock". The Heraldry Society. Retrieved 2018-10-09. ^ Wright, Thomas (1864). 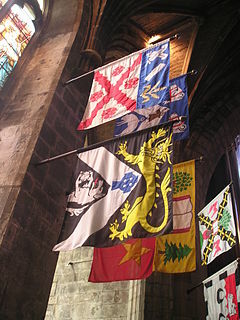 The Roll of Arms of the Princes, Barons, and Knights who Attended King Edward I to the Siege of Caerlaverock, in 1300. Londone: J.C. Hotten. p. 18. ISBN 0-900455-25-X. ^ "HRH The Duchess of Cornwall: Titles and Heraldry". Official website of the Prince of Wales. Retrieved 2018-10-09. ^ "The Coat of Arms of HRH Prince William of Wales". Official website of the College of Arms. Retrieved 2018-10-09. ^ "Coat of Arms of Duchess of Cambridge". dukeandduchessofcambridge.org. 14 November 2012. Archived from the original on 6 November 2012. Retrieved 2018-08-10. Aveling, S. T. (1890). Heraldry: Ancient and Modern including Boutell's Heraldry. London: Frederick Warne and Co. ISBN 0548122040. Brooke-Little, John (1978) . 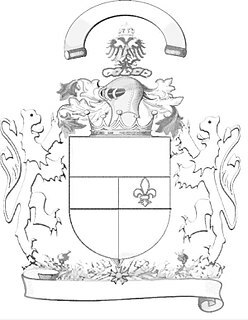 Boutell's Heraldry (Revised ed.). London: Frederick Warne LTD. ISBN 0-7232-2096-4. Fox-Davis, Arthur Charles (1909). A Complete Guide to Heraldry. London, Edinburgh: T.C. & E.C. Jack. ISBN 0543958140. Pinces, John Harvey; Pinces, Rosemary (1974). The Royal Heraldry of England. Heraldry Today. Slough, Buckinghamshire: Hollen Street Press. ISBN 0-900455-25-X. Scott-Giles, Charles Wilfrid (1967) . The Romance of Heraldry (Revised ed.). J.M. Dent & Sons. ISBN 0900455284.